Support landing craft, in the form of Landing Craft Gun (LCGs), Landing Craft Flak (LCFs) and Landing Craft Rocket (LCRs), provided fire power to soften up entrenched enemy positions on and near the landing beaches in advance of the initial assault troops. Furthermore, LCFs & LCGs provided troop and tank carrying landing craft with on going cover against enemy attack from land, sea or air as well as shelling inland targets identified by the Army that were within range. This account provides an insight into the establishment of a support squadron and its deployment. It was written by Chief Engine Room Artificer (CERA) Robert Wallace-Sims who was attached to Combined Operations Command for nearly 3.5 years before returning to the 'regular' Navy after the war. It was Christmas 1942 and six weeks leave had passed quickly. I reported back to the Royal Naval Barracks, Portsmouth, on February 2nd. The next day I attended the Diesel School at Chatham for a three weeks course on Paxman diesels engines, after which I was transferred to HMS Dundonald, a Combined Operations training establishment in Troon, Ayrshire, where Landing Craft Tank (LCTs) were commissioned and worked up before being released for joint amphibious training exercises with the Army. After three weeks in Troon, during which time I don't remember doing any useful work, I reported to Harland and Wolff in Belfast to take over the maintenance of the 8th LCT Flotilla. There was no accommodation available on site so I was billeted with a delightful old lady who suggested my wife should join me. 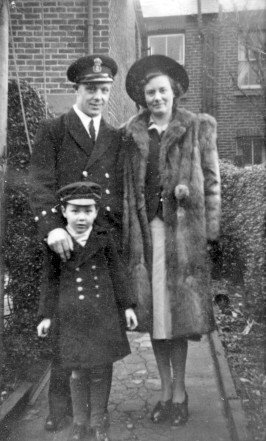 Although Belfast was a prohibited area I obtained the necessary travel documents and she arrived shortly thereafter. Meantime, I reported to the Flotilla Officer and found an unusual degree of secrecy. 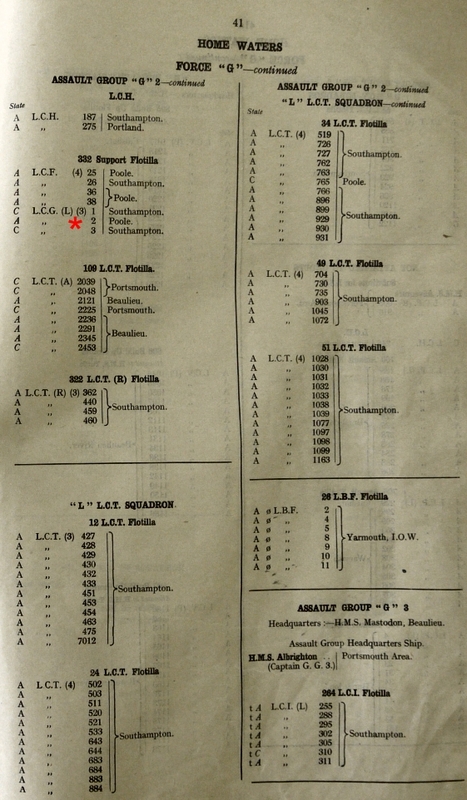 There were twelve LCTs in Harland and Wolff’s yard undergoing conversion to Landing Craft Guns (LCGs). The work required a new deck over the existing tank deck and converting the resultant enclosed space to magazines and living quarters. On the deck above, two 4.7 inch guns were mounted forward of the bridge. Twelve more craft were undergoing similar conversions in London, whilst elsewhere, twelve more were being converted to Landing Craft Flack (LCFs) and a further 12 to Landing Craft Rockets (LCRs). The whole would eventually join forces as a support squadron to cover landings. The maintenance crew consisted of myself, 4 Engine Room Artificers (ERAs), 2 Motor Mechanics, 4 Stokers, a Shipwright, two Joiners, an Ordinance Artificer, a Seaman Gunner, an Electrical Artificer and three wiremen for the electrics. 20 in all whose collective job was to maintain all twelve craft in operational condition. I found my maintenance crew were either hostilities only (HOs) or Royal Navy Volunteer Reserve (RNVR). This was my first experience of RNVR Officers and HOs and they were a fine and competent crowd. None of the maintenance staff, including the Engineer Officer, who was a Croxley Heath dirt track rider, had more than six months service. Their knowledge of Paxman diesels was as much as they had managed to learn on the same training course I had attended. The first two completed craft left Belfast at the end of March 1943 for Falmouth but they had a serious design flaw, which would prove to have fatal consequences. The forward end of the tank deck had been left open with the bow door and winches in a fully usable condition. The tank deck of an LCT had a series of drains running down to a duct keel, which could be pumped out. Although watertight bulkheads had been fitted, the drains had not been sealed off so, in effect, there was no real water tightness. Off Milford Haven, the two craft ran into very heavy weather and sea-water was shipped over the bows, which found its way into the duct keel and up into the mess decks and magazines. The one bilge pump in each craft was overwhelmed by the amount of water and consequently both craft foundered with most of their crews. Orders came through for the doors to be welded up and the deck to be fully covered in. The result was a very strong, stable and sea worthy craft but it was mid-May before the whole squadron arrived in Falmouth. One ship from the 6th Flotilla joined us making our flotilla 11 strong. From Falmouth we sailed in convoy with a large number of LCTs to Dijelli in North Africa, where the Squadron was split in two, half remaining in Dijelli, while the others moved further east to Sousse. After about five weeks we moved to Malta arriving there in early July. This was my first visit to Malta since Christmas 1941. German bombers had caused colossal damage but, by some miracle, all the pubs we had used then were still standing! 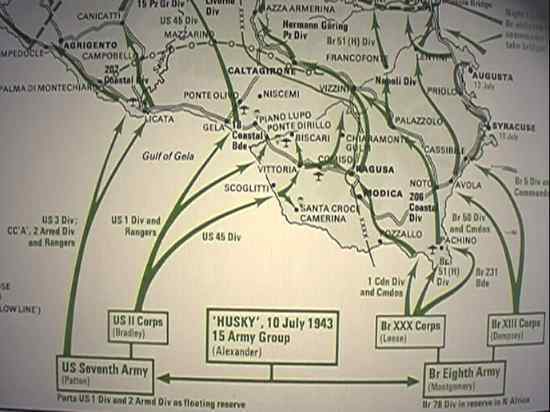 On July 9th we moved out for the invasion of Sicily, arriving off Regussa in the early hours of the 10th. We were in the lead as we approached the landing beaches, followed by masses of landing craft and ships of all shapes and sizes. Our LCGs went in with all guns firing, while behind us the Rocket craft released their projectiles from about two miles off shore. The sight and sound of salvos of about 200 or more rockets, from each craft, was awesome. They carried about 600 rockets fired in banks of about 200. Having exhausted the 600 they retired to reload. Below are the diary notes of an unknown veteran which gives some sense of the day's events. Fri 9th July Stand by call to action stations. Sat 10th July 02.25 All's well. Flashes of AA fire from the beach. Beach well in sight, cruisers and destroyers steaming on starboard beam. 02.35 All's well. Beach lit up by star shells. AA fire. Waiting to go in. First wave of RM Commandos in LCG 3 believed gone in. 02.45 Our wave ready to go in, LCGs 9 & 10 with Canadians. LCG 3 just going in. RAF still carrying out softening process. 03.00 No action as yet. Bombing and AA fire still active. 03.15 Moving into beach on port side. A’s and M’s loaded with RM Commandos disappear in darkness towards beach. 03.30 Standing by to fire. Steady bombing still in progress. Range approx. 2 ½ miles, 4000 yards. 03.45 Still moving in, covering port side of landing. 04.00 No shelling as yet. Intensified bombing still in progress. Range approx. 4000 yards. 04.25 All guns loaded with reduced charges. Exchange of fire between MLs and machine gun posts. Still closing with beach. Range 3500 yards. 04.30 Prepare to fire on machine gun posts from which tracers are pouring. Range 1000 yards. Dawn is now breaking. Troops still pouring in. 04.35 Manoeuvring for covering fire and bombardment. No sign of any action against ships yet. 04.40 Heavy smoke screen covering island. No shots fired at us as yet. Rocket ships fired salvos and cleared machine gun posts. 04.45 Dawn has broken. Everything is clear. Destroyer fires two salvos and then withdraws. Battery opens up at us. A large number of ships on the horizon. Still training guns on target but still no shelling. Shots straddle ship and make it shake. Enemy shore batteries firing at LCGs. 04.55 Begin firing in reply to enemy guns. Enemy guns silenced. Bridge reports ammunition dump hit. Clear daylight, action well under way. Expecting next shot to hit us. LCG firing closer to beach. LCAs standing off beach. Troops pouring in. Shelling growing strong. 05.20 LCG 9’s gunfire effective. 05.30 Not much reply from the enemy, must be engaged by troops. Odd shots dropping by craft. Many of our planes visible. Enemy battery silenced by us. Complimented by craft coming alongside. Fires starting on shore, landing craft standing off. Troops pouring in – 8th Army. 05.40 Resistance not heavy, it appears that aircraft supported overhead. Pongos being ferried ashore. Shelling still continued, enemy guns silenced. 05.50 No important developments. Tanks, troops and amphibians still streaming ashore. Bursts of Bren fire on shore. 07.45 Town appears to be taken. Fighting continues but not very heavy. Machine gun fire coming from hills. Large explosion in water, just off beach. 08.00 No further developments. Expecting enemy naval forces. We are now lying 800 yards of landing beach, 200 yards off rocky point. Water is only 25 feet deep, too shallow for LCIs to beach. Troops being taken ashore in LCAs. Just said hello to some pals in an LCA passing on the starboard quarter. It’s a small world. 51st Division still pouring in. More troop ships than that standing by, out to sea. Monitors and Destroyers, which took part in shelling from further out, standing by, also awaiting orders from Admiralty. 09.00 We are now at a large bay at east tip of island. The town is on our port beam, and on port bow large fires with dense smoke have started. The landing beach is sandy, merging into fertile countryside, with flat hill in the distance. Artillery landed sometime before, and are now engaging enemy positions. Circling aircraft are keeping a stout vigil. 09.30 Heavy explosions now occurring regularly on shore. Hands to cruising stations. 10.45 Bombardment by 6" cruiser and destroyer. 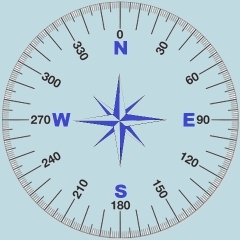 Enemy resistance on land. Aircraft bomb positions. AA fire returned. Ten minutes bombardment. Amphibians moving in to land. Tanks visible on beach. LCIs still unloading troops. Other landings reported successful. 15.00 Aerodrome captured. Shelling not required. 15.45 Enemy being shelled in town by 15" monitor. Range accurate. Fall of shell excellent. 16.00 Rumble of gunfire on ridge from top of island. Heavy fighting continues. Casualties unknown. 19.55 Bombardment by 6" cruiser to assist our troops. 21.30 Sing song in progress on B gun deck. 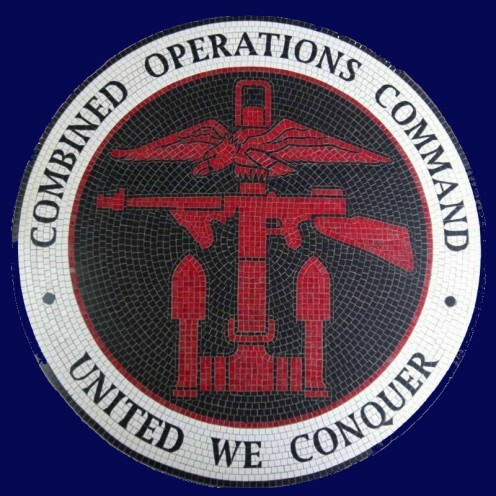 Ammunition issued to all Marines. 21.45 Moving out of bay to edge of convoy to watch for mines and E boats. 22.00 Air attacks commencing. The sky is lit up like Blackpool illuminations. Dive bombers attempting to destroy troopships. 22.30 A stick of bombs has just fallen 50 yards astern and ahead, and two to port and two to starboard. 22.45 A large bomb has just dropped on starboard quarter. Bombing is getting more accurate. Two minor casualties. The Marine Officer has been grazed on the leg and Yorky was struck in the stomach with a small piece of shrapnel. None serious. 23.15 No ship appear to have been hit. Smoke clearing away. Two LCIs are alongside, and cannot reach their parent ship. Sun 11th July 01.00 Shelling by 15" Monitor. Flares on beach. 05.35 Firing with rifles at believed enemy mines and suspicious objects. Enemy opposition on shore against tanks serious. RM Commandos did splendid job. Silenced machine gun posts and captured 1,000 Italians. 08.00 Bright sunshine. General clean up of ships. Standing by for further orders. The Sicily landings were successful and we had no casualties. In the following days we moved along the coast in support of the advancing army and, by the 16th August, the whole of Sicily was in our hands and the 8th Flotilla was 'resting up' at Augusta. There was no rest for the maintenance crew, however, since all main engines were due to have their cylinder heads removed and overhauled. This involved grinding in twelve exhaust and twelve inlet valves and refitting 12 fuel injectors on each of 22 engines. Even with help from the craft motor mechanics and stokers, it was a tough order. In practice ERAs, OAs, EAs and shipwrights all mucked in together. 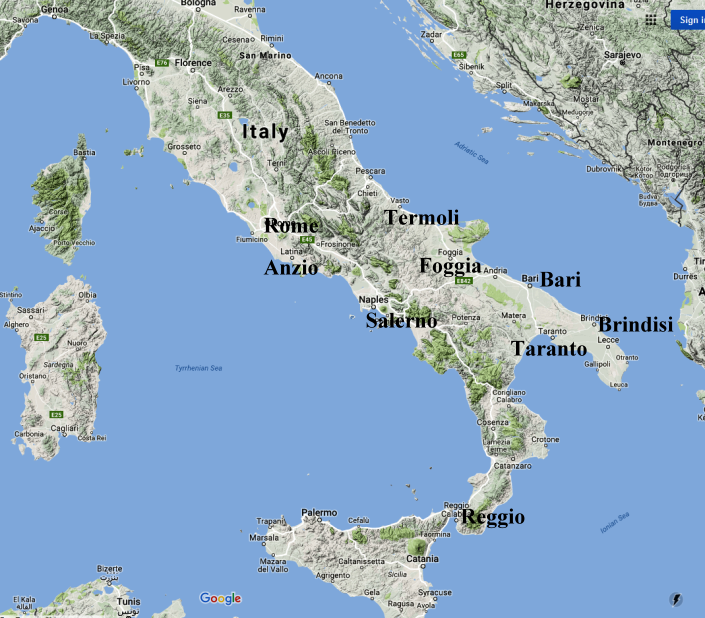 By the 31st August, 1943, we were at Messina in the north east of Sicily overlooking Reggio on the Italian mainland. The Battleships were already bombarding the Italian mainland. On Sept 2nd, we covered landings at Reggio De Calabria. Again no casualties and 3 days later the whole of Calabria was in our hands. On the 12th September, Italy surrendered and we saw the Italian Fleet pass by to formally surrender in Malta. However, with the Germans still occupying the country, the battle for Italy was far from over. On the 13th September, half our Flotilla was giving support in the heavy fighting off Salerno. I was not on this particular operation when one of our craft was hit on the bridge and all Officers and Coxswain were killed, leaving one Petty Officer, the motor mechanic, to take command. Together with the Sergeant of Marines, they continued the fight until ordered to withdraw. He then took his craft back to Malta and received the Conspicuous Gallantry Medal (CGM) for his courageous and resourceful action. The whole squadron returned to Dijelli, where, once more, it was split in two - one half to stay in the Mediterranean and the other to proceed to Milford Haven, which included us. We were part of a large convoy and encountered no enemy on the return journey but, in very rough weather, five LCTs foundered with the loss of all lives. In addition, two broke in two but the crews were taken off. Our craft, with their covered holds, had no problems other than engine breakdowns... I changed craft six times on the trip to deal with 'big end' failures. We were diverted to Glasgow where all engines were found to be in dire need of major overhaul. Only 11 out of 22 engines were running on all cylinders. Some had scoring of the crankpins, which prevented the fitting of spare bearings and to allow the engines to operate in this condition, the pistons on the affected cylinders had been removed, balance weights fitted to the cranks to prevent excessive vibration while inlet and exhaust valves had been fitted to the affected cylinders with telescopic push rods to stop them opening. Three weeks after arrival in Glasgow the craft had been handed over to Ship Repairers and the Flotilla disbanded. We were drafted to HMS Westcliff, at Southend on the south coast of England, for leave and to await fresh orders. After three weeks leave over Christmas, 1943, I reported back to Westcliff. A week later I was at Euston Station in charge of a draft of 30 to form the 332nd Support Flotilla. This time the Flotilla Officer was a Lieutenant RN, the Engineer Officer an RNVR Lieutenant, who in Civvy Street was the engineer in charge of Post Office transport in Scotland. He informed me, "I don't propose to interfere; maintenance of all craft and supervision of the maintenance staff is yours." This suited me well and later on he told me he had pulled strings to get me. We were to be in Glasgow until the end of March so my wife joined me. All the craft were being fitted with replacement engines by private contractors. My job was to check on progress in seven different yards on both sides of the Clyde stretching from Rothesay to the centre of Glasgow. A lot of travelling was involved for which we were supplied with a 350 cc BSA motorbike and a jeep. By early March I had a full complement and had been able to pick those I wanted as my crew. I recruited half of my old staff, the rest had been drafted elsewhere. At the end of March, I returned the BSA to the garage and we sailed 500 miles south to HMS Turtle at Poole in Dorset. Here we commandeered a house near the beach for the officers and later I found the motorbike at the back. The EO had brought it down because he thought I might wish to live at home in Southampton! 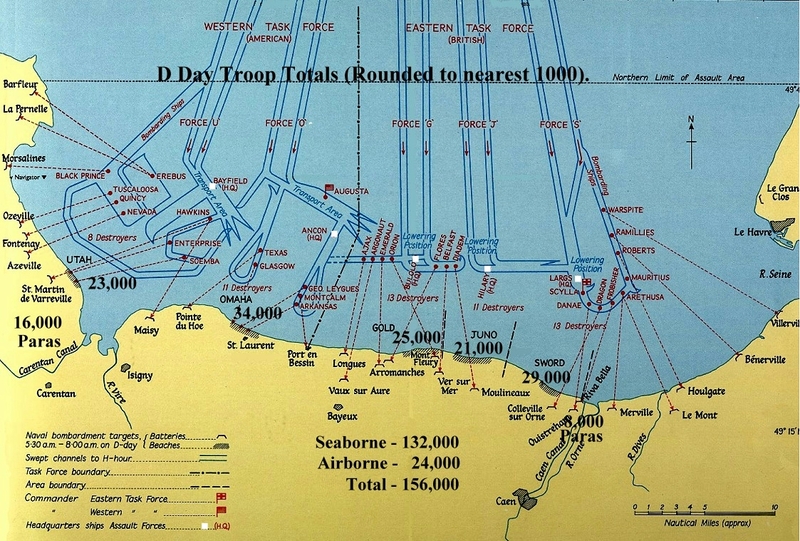 On the night of 5 June, 1944, after a delay of 24 hours due to bad weather, we set off for Omaha beach near the town of In early April we moved to the Beaulieu River. The Officers were billeted in Exbury House, the Ratings in bell tents on the lawn and yours truly at home! At Exbury we undertook daily exercises and carried out essential maintenance until the end of May, when we moved to the Eastern Docks. These were full of craft and ships of all types and sizes. We stored our ammunition and supplies to full capacity and on June 4th were ready to sail for the invasion of Normandy. We were to leave at 2000, arriving off the French beaches at 0600 the next morning. However, the weather was against us and we actually sailed 24 hours later. It was a rough trip and the American Mark V LCTs had a particularly hard time. Several of them capsized and quite a few were taken in tow. They were very small craft, never meant for anything but calm weather. From one we picked up our Flotilla Officer from the 8th Flotilla! At 0400 the next morning we went to action stations. Our job was to go in first together with the Flak and Rocket Craft to lay down a barrage before the troops were landed. We went in line abreast followed by the rocket craft. Out beyond them were destroyers and cruisers and further out still, two monitors and HMS Warspite. All opened fire a little after 0500, the noise was horrendous and morale in the enemy ranks must have dropped to zero. 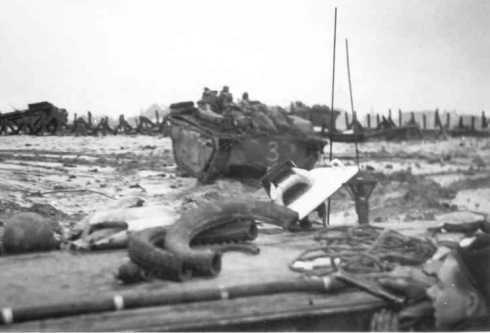 The landing craft on our beach had very little trouble at first although resistance gradually increased. Bombardment Liaison Officers accompanied the initial assault troops. They're job was to relay information to us on targets the Army wanted us to fire on. Our two guns fired continuously from 0500 until 2300 stopping only when we ran out of ammunition. Thus ended what became known as the "Longest Day" ... and long it was. After D-day, we spent three days firing 4 ½ inch shells at unseen targets beyond the beachhead identified for us by Army Forward Observation Officers (FOOs) positioned inland. They reported back on the accuracy of our fire so we could make adjustments to the range and direction, if necessary. On D + 5, LCG 2, in which I was billeted, was ordered to go inshore to draw the fire of an enemy shore battery, which had defied the efforts of the RAF to destroy it. With some trepidation we weighed anchor and proceeded inshore firing in the general direction of the battery. There was no response from the enemy until we made a 180 degree turn to avoid beaching. As we headed away from the cliffs our guns were unable to bear on the enemy position. Three explosions followed in fairly quick succession, The first lifted our stern out of the water, the second was a 15" salvo from HMS Warspite and the third was Warspite's eight 15" HE shells hitting their target. This battery was mobile, on railway lines and normally took refuge in a tunnel at the first hint of danger. On this occasion, as soon as they exposed their position on firing at us, Warspite fired on the known location of the gun before it could take cover. The enemy shell had exploded between our rudders putting our steering gear out of action - it was impossible to turn the wheel. However, we had been lucky. If the incoming shell had had twenty feet longer range, I would not be writing this. Using the main engines for steering we put the LCG on the beach and examined the damage when the tide went out. Both rudders were bent outwards and since they could not be straightened in situ, we dug deep holes in the sand, disconnected the rudders and dropped them free of the ship. Meanwhile our signaller tried in vain to locate a repair ship... but all was not lost. There were many craft on the beach some of them apparently damaged beyond repair, so I decided to cannibalise one of them. I rounded up my four ERAs and some Stokers and set off along the beach. We walked about a mile when we came upon a craft which had the same gear as our LCG 2. She was deserted and very high out of the water. Whilst the Stokers dug holes in the sand the ERAs disconnected all the gear and then, just as we were going to drop the rudders, a voice behind me said, "What are you doing?" A young RNVR Lieutenant informed me that he was sailing for Southampton at 0800 the next day. It was now 22.00 hrs so we replaced all the gear and returned empty handed to our LCG . We hadn't gone far, when out of the dark came the challenge "Halt, who goes there?" I replied "Friend." "Advance friend and be recognised." It was a Royal Engineer NCO who informed me that the beach was mined and had not yet been swept. The rest of our return journey along the beach took much longer than expected! By now the tide had risen so we turned in for the night. Next day we received orders from the Senior Officer to join the evening convoy so that repairs could be carried out in Southampton. At 22.00 hrs, with 14 other landing craft, we sailed, steering by engines. We should have arrived at Southampton at 09.00 hrs the following morning but, come daylight, we were alone. However, through the haze we could see the Isle of Wight and at 10.00 hrs we berthed at Town Quay. An hour later a tug arrived and took us up the River Itchen to White's Yard. We subsequently learned E boats had got in amongst the assembled ships and craft and one of our ships had been sunk. To prevent a repetition, all Flak and Gun ships were re-assembled as the Support Squadron, Eastern Flank, and each night we formed a protective screen around the ships and Mulberry Harbour. This lasted three weeks during which time there were a few sporadic raids. However, by the end of July the army was too far inland for the squadron to offer support, so we returned to Poole to refit and to lick our wounds. The next couple of months were employed in routine overhaul and maintenance duties. We were beginning to feel that the war had passed the Support Squadron by. Then, towards the end of October, we were ordered to prepare 6 LCGs, 6 LCFs, 5 LCT(R)s, together with 6 smaller support craft armed with guns and smoke mortars and 2 LCG(M) (medium) for a further action. 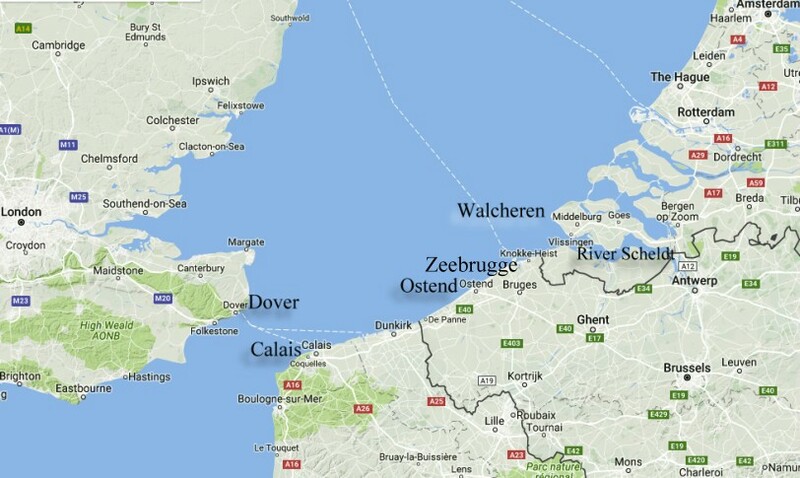 We sailed from Poole to Ostend and on October 31st, we received our orders. D-day was Nov 1st with H-hour 09.45. We were to support the Royal Marine Commando landing at Westkapple on Walcheren, an island in the River Sheldt estuary. Three heavy warships, HMS Warspite and the monitors HMS Roberts and HMS Erebus with their 15-inch guns, were to support us. We would go in under cover of an aerial bombardment. The morning dawned cold and miserable with low visibility. Unfortunately this poor weather was general all over Northern Europe and the RAF was grounded by fog. The air support, which was an integral part of the original plan, was not available. However, after a hurried conference it was decided that the landing should go ahead. The action started with a bombardment by the heavy ships, whilst the LCGs closed in on the Westkapple battery with the object of destroying it. However, our 4.7 inch shells just bounced off the concrete emplacements. We had been firing for about an hour and a quarter when the LCT (R)s opened fire. Two of them fired amongst the LCGs and LCFs. LCG 2 and 2 of the LCFs were damaged. It was my most terrifying experience of the war. As the Marines closed on the beach, the enemy batteries opened fire on them and we were ordered to draw the enemy fire from the marines. Two LCG(M)s went close in to the beach, No 1 was literally blown to pieces almost at once. There were no survivors. No 2 was repeatedly hit by 88mm shells, but managed to withdraw only to sink in deep water with only six casualties - 2 killed and 4 wounded. LCG 1 went in with all guns firing and closed to 600 yards in spite of being hit three times and set on fire. She was hit several more times and put out of action. LCG 17 tried to take her in tow but LCG 1 sank. LCG 17 continued to give support, but was hit several times and was set on fire. She was ordered to withdraw. LCGs 10 and 11 were also damaged but continued in support until Walcheren was taken on the 8th of November. Of the 6 LCGs, one was lost and 5 badly damaged. Of the LCTs, 2 were lost and 3 were damaged and only 2 of the Rocket Craft were undamaged. Of our crews 172, had been killed and 204 wounded. However, the enemy fire had been drawn from the Marines and they were ashore with far less casualties than the support squadron had suffered. The cumulative effect of our shells, including the 15 inch, was to put one gun out of action when a 4.7 inch, from one of the LCGs passed through the firing slit. Had the enemy ignored the Support Squadron and concentrated their firepower on the landings, the Marines were unlikely to have made it. With the battle over, we limped back to Ostend, a tired and ragged convoy, some under tow, few with both engines running and all with pumps going flat out to stay afloat. At Ostend we patched up the hulls as best we could. Some had plates bolted on, we found it virtually impossible to weld mild steel plates to the hulls. Cement boxes covered a lot of the holes. LCG 17 had 47 patches on her hull as she left for Poole. 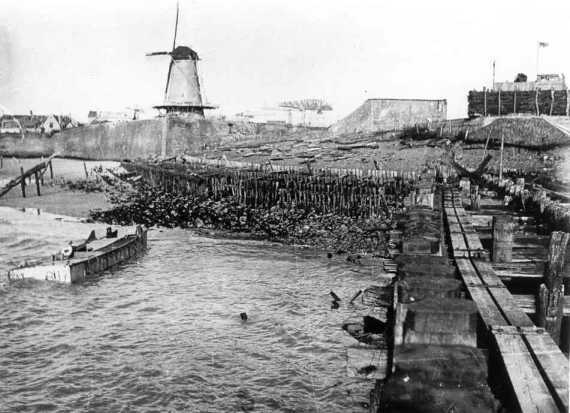 Following the action, 200 mine sweepers cleared the Sheldt Estuary and the port of Antwerp was opened to Allied ships - a vital link in supplying the Allied armies as they advanced towards Germany. 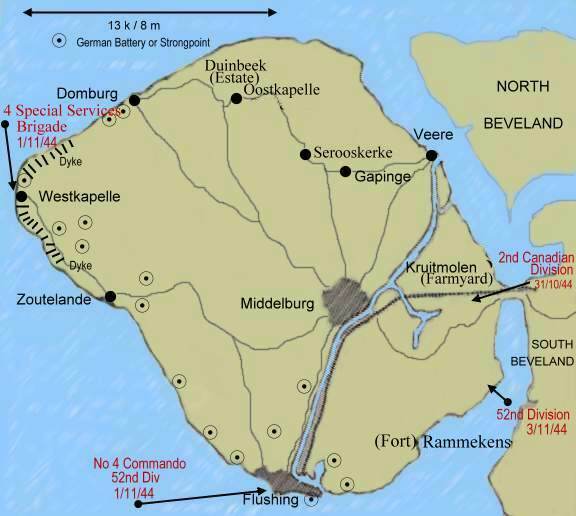 Visit Operation Infatuate for a comprehensive account of the Walcheren action. Photos l -r: (1) Amphibians (Buffalos) coming ashore at Westkapelle; (2) Oranjemolen (Orange Mill) at Flushing (Vlissingen) where No. 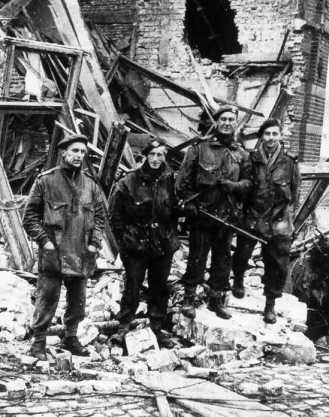 4 Commando landed early on 1/11/44; (3) French Commando Officers in Flushing - Lt. Guy de Montlaur, Lt. 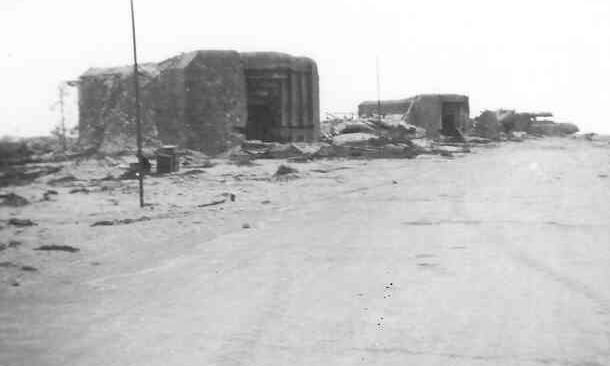 Guy Hattu, Commandant Phillippe Kieffer & Lt Jacques Senée; (4) Bunkers of the German coastal battery at Westkapelle. 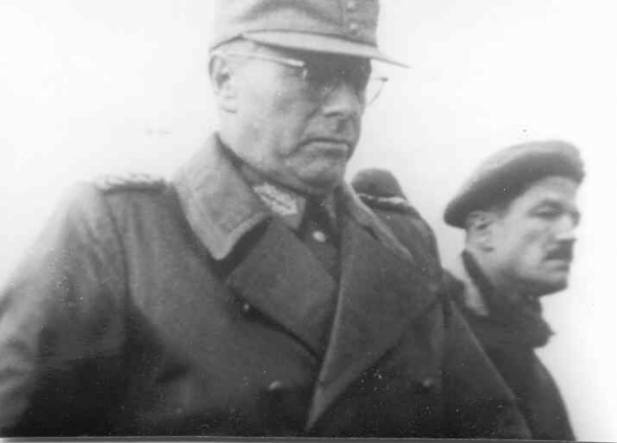 The first two are for 9.4 cm artillery and the third for fire direction; (5) Lt./General Wilhelm Daser, Commander of the 70th Infantry Division & Fortress Commander of Walcheren led into captivity accompanied by Major Hugh Johnston of the Royal Scots. The Battle of Walcheren saw the end of the war for the Support Squadron. We stayed at Poole for a few months and then moved down to Appledore in Devon to lay the ships up in reserve. We spent about six weeks drying out the engines and pumping around inhibiting oil to prevent rust. This done, we left the ships and returned to Poole where we spent the next few months laying up US Tank Landing Craft on the beach at Arne. Gradually my staff were drafted away to other jobs until I was left on my own. I was then absorbed into the Base Staff to maintain the few landing craft still on the Channel run. Early in July, 1945, I was advised to stand by to commission a new Flotilla of LCGs converted from Mark10 landing craft. They were to be 'tropicalised' so I attended Hall's of Dartford for a refrigeration course, at the end of which I returned to Poole, but I never did commission the new Flotilla since the war ended before they were ready. The coming of peace brought orders to close some of the Combined Ops bases, among them HMS Turtle. It took about three months and then I moved up to Troon and closed down there. Next a draft to HMS Tullicuan a shore base at Balloch on Loch Lomond. Why I was there or what I was supposed to do, I never did find out. No ships, no small landing craft or even a motorboat and no engine room staff. I only recall checking through service certificates and issuing medal ribbons! By now I was the last Chief ERA in Combined Operations, all the others having returned to General Service. Many of my old staff, who were 'Hostilities Only', were being demobbed. I received orders to report back to RNB Portsmouth on May 31st. 1946. I had been away for three years and four months. Having spent all this time with none of the usual Naval Bull, it was with some trepidation that I returned. After three weeks leave and three weeks playing snooker, I reported to HMS Indefatigable, at the time the largest of Britain’s aircraft carriers. At 28,000 tons and 152,000 HP, I was about to switch from some of the smallest craft in the Royal Navy to the largest. I found I had charge of the main engines, workshops and diesel generators - the latter being Paxmans, the same as in the LCGs... but all that's another story. Written by Chief Engine Room Artificer (CERA), Robert Wallace-Sims. Edited for website presentation by Geoff Slee including the addition of maps and photos.